Look at this photo... Bourette Haiti, a big wooden wheelbarrow in Haiti. 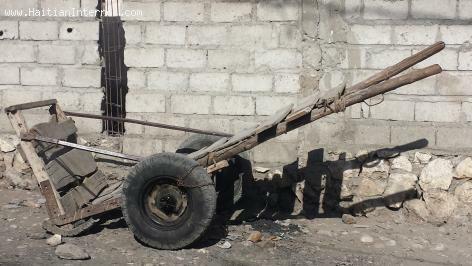 This big wheelbarrow in Haiti is used to transport lots of merchandise from one point to another in short distances. It sits on two wheels and is often pulled by one man while another man is pushing it.